Dowding with some of "The Few"
The Few were the airmen of the Royal Air Force (RAF) and the aviators of the Fleet Air Arm, Royal Navy (RN) who fought the Battle of Britain in the Second World War. The term comes from Winston Churchill's phrase "Never, in the field of human conflict, was so much owed by so many to so few." It also alludes to Shakespeare's famous speech in his play, Henry V: "We few, we happy few, we band of brothers..."
Nearly 3,000 men were awarded the "Battle of Britain" clasp. As of February 2019[update], only six survivors of The Few are still living. By one tally, British RAF aircrew numbered 2,353 (80%) of the total of 2,927 flyers involved, with 407 Britons killed from a total of 510 losses. The remainder were not British, many coming from parts of the British Empire (particularly New Zealand, Canada, Australia, and South Africa), as well as exiles from many conquered European nations, particularly from Poland and Czechoslovakia. Other countries supplying smaller numbers included Belgium, France, Ireland, and the United States. The Battle of Britain anniversary parade at Buckingham Palace in 1943. Winston Churchill summed up the effect of the battle and the contribution of RAF Fighter Command, RAF Bomber Command, RAF Coastal Command and the Fleet Air Arm with the words, "Never in the field of human conflict was so much owed by so many to so few". Pilots who fought in the battle have been known as The Few ever since; at times being specially commemorated on 15 September, "Battle of Britain Day". On this day in 1940, the Luftwaffe embarked on their largest bombing attack yet, forcing the engagement of the entirety of the RAF in defence of London and the South East, which resulted in a decisive British victory that proved to mark a turning point in Britain's favour. The memorial to The Few at Capel-le-Ferne, atop the white cliffs of Dover . . . 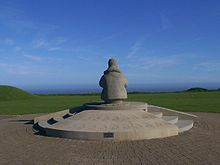 The aircrew are remembered on the Battle of Britain Memorial, Capel-le-Ferne, Kent, and their names are listed on the Battle of Britain Monument in London. The Battle of Britain Roll of Honour is held in Westminster Abbey in the RAF Chapel, and is paraded annually during the Service of Thanksgiving and re-dedication on Battle of Britain Sunday. There is a preserved Hawker Hurricane fighter aircraft known as "The Last of The Many"—a reference to the 1942 film The First of the Few starring Leslie Howard as R.J. Mitchell, designer of the Spitfire—which flies as part of the Battle of Britain Memorial Flight, along with a Supermarine Spitfire that flew in the Battle (one of five Spitfires in the Memorial Flight). As the Hurricane was the last production model of that type, it did not itself fly in the Battle. 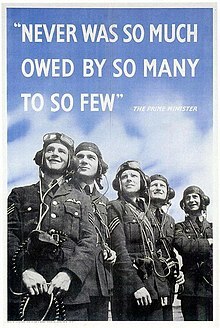 The Battle of Britain was considered officially by the RAF to have been fought between 10 July and 31 October 1940. RAF pilots claimed to have shot down about 2,600 German aircraft, but figures compiled later suggest that Luftwaffe losses were more likely nearer 2,300. Of 2,332 Allied pilots who flew fighters in the Battle, 38.90 percent could claim some success in terms of enemy aircraft shot down. The number of pilots claiming more than one victory amounted to no more than 15 per cent of the total RAF pilots involved. To be proclaimed an "ace" a pilot had to have five confirmed victories. During the Battle of Britain just 188 RAF pilots achieved that distinction – eight per cent of the total involved. A further 237 of those RAF pilots claiming successes during the Battle became "aces" later in the war. There were four pilots who were "ace in a day" in the Battle of Britain: Archie McKellar (British), Antoni Głowacki (Polish), Ronald Fairfax Hamlyn (British) and Brian Carbury (New Zealander). United Kingdom 41 Spitfire 21 Total 26 kills. KIA 3 August 1941. United Kingdom 605 Hurricane 19 Total 21 (possibly 22) three probable and three damaged. 5 Bf-109's on 7 Oct 1940. KIA 1 November 1940. (23 by end of November) Total 28 kills. Czechoslovakia 303 Hurricane 17 Killed 8 October 1940. Poland 145 and 303 Hurricane 15 Total 18 (possibly 20) kills. New Zealand 54 Spitfire 14 + ½ Total 27.7 kills. Australia 234 Spitfire 14 + ⅚ KIA 7 Sep 1940. United Kingdom 32 Hurricane 14 Wartime total 22 victories. The Few, a novel by Alex Kershaw, tells the stories of the men who flew in the Battle of Britain. As of 2003[update], a Hollywood film similarly named The Few was in preparation for release in 2008, based on the story of real-life U.S. pilot Billy Fiske, who ignored his country's neutrality rules and volunteered for the RAF. A Variety magazine outline of the film's historical content was said in The Independent to have been described by Bill Bond, who conceived the Battle of Britain Monument in London, as "Totally wrong. The whole bloody lot." ^ "Visiting the Abbey: The Royal Air Force Chapel." Westminster Abbey. Retrieved: 13 May 2012. ^ "Battle of Britain war hero pilot, 100, who is one of only seven surviving members of 'The Few' is honoured with special birthday flyover by the Red Arrows". MSN. Retrieved 3 February 2019. ^ Plain Design; Total Onion (1 February 2019). "Sad death of another of the Few". Retrieved 3 February 2019. ^ Bickers 1990, Appendix 24, p. 358. Note: Gives the numerical breakdown by nationalities. ^ Bickers 1990, Appendix 25, pp. 359–376. Note: Gives a complete list of the Allied aircrew in the Battle. ^ Wood and Dempster 1990, p. 187. ^ Wood and Dempster 1990, pp. 194–203. Note: Gives a complete list of the Allied aircrew in the Battle. ^ Speech to the House of Commons on 20 August 1940. ^ "Battle of Britain Day". BBC. Retrieved: 18 March 2015. ^ "Battle of Britain 70th Anniversary" Archived 15 November 2013 at the Wayback Machine. The Royal British Legion. Retrieved: 18 March 2015. ^ "Battle of Britain Memorial." battleofbritainmemorial.org . Retrieved: 7 September 2011. ^ Crang, Jeremy A. "Identifying the 'Few': The Personalisation of a Heroic Military Elite." Archived 15 September 2010 at the Wayback Machine Names of the 'Few', via University of New South Wales, War & Society, Volume 24, Number 2, November 2005. ^ Shores, Christopher and Clive Williams. Aces High. London: Grub Street, 1994. ISBN 1-898697-00-0. ^ Fleming, Michael. "New flight plan for Cruise." Variety, 9 September 2003. Retrieved: 28 December 2007. ^ Moreton, Cole. "Hollywood updates history of Battle of Britain: Tom Cruise won it all on his own." The Independent, 11 April 2004. Retrieved: 28 December 2007. Bickers, Richard Townshend. The Battle of Britain. New York: Salamander, 1990. ISBN 0-13-083809-8. Wood, Derek and Derek Dempster. The Narrow Margin. Washington: Smithsonian Institution, reprint 1990. ISBN 0-87474-929-8. McGlashan, Kenneth B. with Zupp, Owen P. Down to Earth: A Fighter Pilot Recounts His Experiences of Dunkirk, the Battle of Britain, Dieppe, D-Day and Beyond. London: Grub Street Publishing, 2007. ISBN 1-904943-84-5. Wikimedia Commons has media related to The Few.